We dare to be different We’re a little bit different. In nearly everything we do. Think all sub sandwiches are equal? Horseradish! Toasting is a wake up call for flavour! Our toaster transform your food and makes everything taste better. Our true toasting releases the flavours in our meats and cheeses. The toaster has always been at the core of our recipes,but now our Chefs are expanding our menu and our NEW toaster will be at the center of every recipe we create. Why do we run everything through our toaster? Toasting wakes it up, brings out the flavour and makes it mouth-watering good. If it doesn’t come from Quiznos, it’s gonna leave you cold! Uncompromising Quality You can’t fake quality. No mystery meat here – we use butcher-quality meats, all-natural cheeses, chef-designed signature sauces and toasted artisan bread. If you want mystery, go to the public library. Every order made to order You can tell us how you want it. 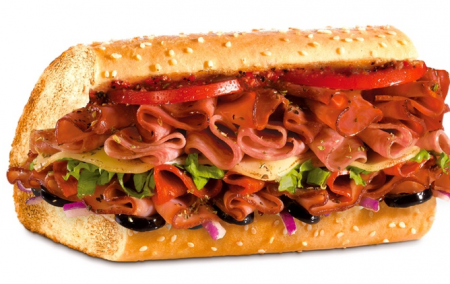 We offer over 20 original sub sandwiches, but you can put on your own spin. Make your sub sandwich your own. Spice it up with our Pepper Bar. Just don’t jump over the counter to make it yourself – we’ve got big, hot toasters back here.